BROOKLYN, N.Y. -- "Kid Chocolate" Peter Quillin once slept on the floors of friends' apartments in New York and struggled to make ends meet as a young boxer with championship dreams. Quillin fulfilled those dreams in a rock-'em, sock-'em fight against France's Hassan N'Dam, dropping him six times and winning a unanimous decision while his hero, Mike Tyson, cheered him on at ringside Saturday night at the new Barclays Center. 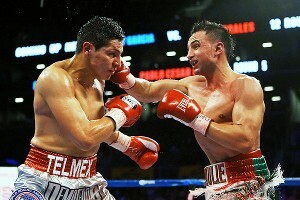 The fight was one of four world title bouts on the card headlined by the rematch between junior welterweight titlist Danny Garcia and former titleholder Erik Morales. Al Bello/Getty Images/Golden Boy Promotions Peter Quillin dropped Hassan N'Dam six times en route to a unanimous decision and a middleweight title Saturday in Brooklyn, N.Y.
"It takes a lot of heart to step in the ring, and I am very happy for this moment," a joyous Quillin said. "This is a blessing." Quillin -- who is Cuban, grew up in Grand Rapids, Mich., and has called Brooklyn and Manhattan home -- looked like he might have an easy night when he scored two knockdowns in the fourth round. He landed heavy left hands and rights as N'Dam seemed hurt by every shot, including the hook that floored him with 30 seconds left in the round. N'Dam went down twice more in the fourth, but referee Eddie Claudio ruled that they were slips -- even though it appeared that punches landed. Still, his legs were very shaky. Quillin (28-0, 20 KOs) dropped N'Dam twice more in the sixth round, and Claudio was looking closely, like he might have been considering stopping the fight. But surprisingly, N'Dam began to throw back and was actually landing. He was still in the fight even though he was obviously trailing. N'Dam won some of the middle rounds and began to rough Quillin up late in the fight. 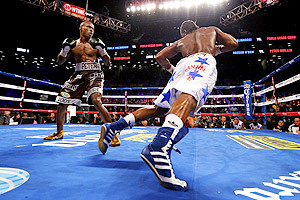 But Quillin, who sent former undisputed junior middleweight champion Winky Wright into retirement in June, closed the show impressively by scoring two more knockdowns in the final seconds of the exciting fight. All three judges scored the bout 115-107, as did ESPN.com. "Brooklyn was behind me, New York City was behind me; I love you," Quillin told the cheering crowd. "I want to thank Grand Rapids for making me a fighter and New York for making me a man. I am an inspiration that shows you that you can do anything in life. This is a historic event, and I am happy to open the Barclays Center by becoming a world champion." N'Dam said he had never been down before. Suddenly, the knockdown total jumped to six. "One thing I know is I have a really big heart," N'Dam said. "I was trying to get my legs back underneath me, but I couldn't. I did my best, but I got caught a couple of times and that was too bad. I only had a month to prepare for this fight. "It's the first time I was ever knocked down, and that surprised me. I kept saying to myself, 'Get up and keep fighting.' I felt like I won the rounds, but he knocked me down, so he won them." Quillin, 29, gave N'Dam (27-1, 17 KOs) credit for coming to his hometown to make his first title defense against him. "He's a champion. I give all credit to Hassan," Quillin said. "It took a lot to come to my backyard and put up a good fight." N'Dam, 28, who was born in Cameroon, said his contract contains a rematch clause. "I definitely want a rematch," he said. "I signed a rematch clause. Next time I'll be way more prepared." Brooklyn's own Paulie Malignaggi got knocked down in a very tough fight but pulled out a split-decision win that many in his hometown crowd booed. Two judges had it 114-113 for Malignaggi and one had it 118-109 for Mexico's Pablo Cesar Cano. Al Bello/Getty Images Pablo Cesar Cano gave Paulie Malignaggi a battle and arguably landed the harder shots in a split decision that went to Malignaggi, the hometown fighter. Malignaggi retained his welterweight title, but Cano wasn't eligible to win it because he didn't make weight. And because of a WBA rule -- one that's different from those of the other sanctioning bodies -- Malignaggi couldn't lose it even if he hadn't gotten the decision. Usually, if a titleholder loses in this situation the belt would become vacant. "I thought I won the fight. I was outboxing him handily," Malignaggi said. "I thought I was controlling the action. He wasn't really landing a lot of shots, but he's a warrior. He was strong. I have a lot of respect for him, but I thought I won it pretty handily." Said Cano: "I definitely don't agree with the decision. The crowd saw who won. I feel I should have won the decision." Malignaggi (32-4, 7 KOs), 31, opened a bad cut on Cano's left eyebrow in the second round, and it bled steadily throughout the fight -- but not enough to cause a stoppage. Cano (25-2-1, 19 KOs), a 23-year-old former interim junior welterweight titlist who was moving up in weight, didn't seem bothered by it, and landed the heavier shots throughout the bout, especially with his right hand. He wobbled Malignaggi with one in the third round and landed a flush right in the 11th round to drop his opponent. Malignaggi made it to his feet and got nailed with another right in the final seconds of the round that badly wobbled him. "I got a little bit lazy," Malignaggi said of the knockdown. "I was controlling the action and I got lazy, and he came over the top with a sharp right hand. I kinda slept on him right there." Cano landed 262 of 757 blows (35 percent). Malignaggi connected on 217 of 826 (26 percent), and they had nowhere near the steam on them that Cano's shots had. Malignaggi made weight Friday at 146.2 pounds, but Cano was 147.8. The fight went on after Cano agreed to pay $50,000 of his $150,000 purse to Malignaggi, who added the money to his $350,000 purse. Also, Cano had to agree to a weight check Saturday morning at which he couldn't be heavier than 157 pounds. He weighed 155. "It was a little bit disappointing to not have the title on the line in the fight," Malignaggi said. "I was really looking forward to having my title on the line. I didn't lose focus, but it was a little disappointing." Next, Malignaggi could face former champ Ricky Hatton on Nov. 24. Hatton, who stopped Malignaggi in the 11th round of a junior welterweight title bout in 2008, is coming out of retirement next month to face Vyacheslav Senchenko, whom Malignaggi won the title from on a cut in the ninth round in Ukraine in April. "I want to see how Ricky looks against Senchenko and then we can definitely talk about it," Malignaggi said. "It would be an honor to fight him again."